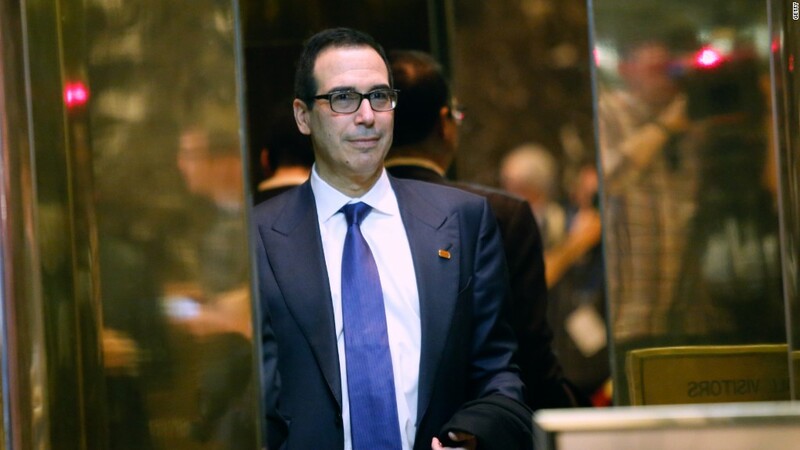 Steven Mnuchin, who President-elect Trump is likely to name Wednesday as his Treasury secretary, can expect to be grilled on Capitol Hill about his days as a mortgage banker. His selection has already triggered outrage from progressive groups. The Progressive Change Campaign Committee, in a statement Tuesday, branded him a "self-dealing Wall Street tool." The group called him a "second generation Goldman Sachs banker who made a fortune foreclosing on working families' homes." Mnuchin's father was a Goldman partner. The California Reinvestment Coalition, which filed a federal discrimination complaint about a bank linked to Mnuchin earlier this month, said, "The fox has been nominated to guard the henhouse." The Democratic National Committee described Mnuchin as "a billionaire hedge fund manager and Goldman Sachs alumnus who preyed on homeowners struggling during the recession." "So much for draining the swamp," the DNC said. Mnuchin, 53, can expect to be grilled about some of his deals during any congressional confirmation hearings. Here is a primer about some of Mnuchin's more controversial business deals. IndyMac was one of the nation's a leading subprime home loan lenders before it failed in July 2008. Mnuchin led an investment group that put up $1.55 billion to buy IndyMac in 2009. According to the FDIC that was pennies on the dollar for the assets being acquired. Mnuchin renamed it OneWest and eventually sold it for more than twice that amount in 2015. The fact that the FDIC agreed to cover the overwhelming majority of IndyMac's losses on bad loans when Mnunchin bought it helped make the bank very profitable during his ownership. During Mnuchin's tenure, OneWest was charged by federal regulators with filing false documents during foreclosures. Employees also failed to make sure they had the correct loan documentation before the bank seized a home. The scandalous behavior is known as robo-signing. OneWest eventually admitted its wrongdoing in a consent decree with regulators. As the housing market stabilized and rebounded, OneWest grew to one of the largest in southern California. In 2015, CIT Group bought the bank for $3.4 billion in cash and stock. CIT itself received a government bailout worth $2.3 billion in 2008, and avoided repaying taxpayers when it filed for bankruptcy a year later. Mnuchin maintains a seat on the CIT Group board. In addition, two fair housing groups in California filed complaints with the Department of Housing and Urban Development earlier this month accusing the bank of discriminating against minority home buyers and neighborhoods. One group charges that in 2014 and 2015, OneWest offered just two mortgage loans to African American borrowers in the area reviewed by the groups. The complaint also claims that the bank "has sited and maintained branches in a way that avoids neighborhoods of color and minority census tracts." CIT, which bought OneWest, told CNNMoney that it "is committed to fair lending and works hard to meet the credit needs of all communities and neighborhoods we serve." --CNNMoney's Danielle Wiener-Bronner contributed to this story.